"Mass Communication is the term used to describe the academic study of various means by which individuals and entities relay information to large segments of the population all at once through mass media. It is usually understood to relate to newspaper and magazine publishing, radio, television, and film, as they are used both for disseminating news and for advertising." The course training aims to equip its students with the relevant knowledge required in the field of mass communication. In simple words, one would be able to gain the in-depth experience on how to communicate with the masses. The program also guides its attendants on the skills required to be a professional in Journalism & News Reporting, Advertising & PR, Corporate Communication, TV & Film Production Arts, News Writing, Scriptwriting, Radio Arts and Editing etc. 10+2/ Senior Secondary/ Intermediate schooling from any stream/ subjects from any recognised university in India. Candidates appearing/appeared in qualifying examinations may also apply. The exams are conducted annually by the University in New Delhi. Students will have the option of giving examination either in Hindi or English mediums. The medium of instruction & teaching would make use of both Hindi & English languages. The variety of career opportunities will be available to the graduates depending on their stream of specialization & interests. The course opens-up the restrictions of entering into the print & electronic media. Students may choose to become New Reporters, Anchors, Radio Jockey, Programme Producer & Researcher, Scriptwriter, PR in Business & Corporate Houses, Creative Visualiser, Event Planner, Editor, Proofreader, Content Developer, Media Planner, Media Marketing, Photographer and much more. 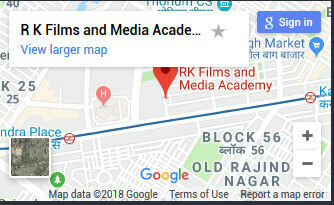 The Academy suggests you to get in touch with our academic counselor to get free personal career counselling session for the careers opportunities available in the Media & Entertainment Industry.